A travel book written by a former Monty Python comedian will become required reading in high school geography classes, Britain's school minister said Thursday, as the government seeks to boost interest in geography. 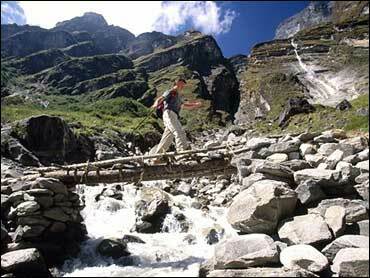 "Himalaya" follows Michael Palin's 1,800-mile, six-month trek through India, Pakistan and China in 2003 and 2004. Palin — known for the catch phrase "Nobody expects the Spanish Inquisition!" on the cult British TV comedy series "Monty Python's Flying Circus" — has filmed seven travel documentaries, including several for the British Broadcasting Corp.
"You can travel the seas, poles and deserts and see nothing," said the 62-year-old actor-turned-world traveler. "To really understand the world, you need to get under the skin of the people and places. In other words, learn about geography. I can't imagine a subject more relevant in schools." The announcement by School Minister Lord Adonis follows the release of a report from the government's education watchdog, the Office for Standards in Education, which said that geography was the worst-taught subject in British schools. Inspectors said high school geography teachers focus too much on drilling facts into students, rather than sparking their interest in other countries and cultures.